Set in the popular seaside town of Termoli, Locanda San Giorgio is 100 metres from Calasveva Beach and 150 metres from the ferry port for the Tremiti Islands. It offers free WiFi and a traditional restaurant. 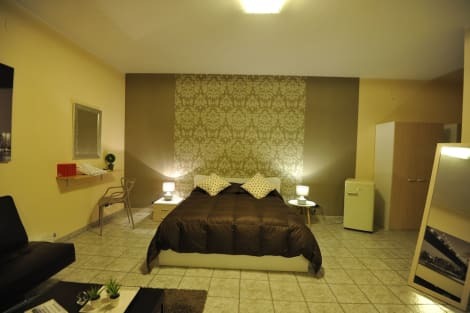 Rooms at the San Giorgio are air conditioned and come with an LCD TV and a private bathroom. Some have Adriatic Sea views. A sweet and savoury buffet breakfast is served each morning. The restaurant is open at lunch and dinner and serves local cuisine. Termoli Train Station is 500 metres away and the cathedral and historic castle are also nearby. Popular local activities include fishing, surfing and scuba diving. lastminute.com has a fantastic range of hotels in Termoli, with everything from cheap hotels to luxurious five star accommodation available. We like to live up to our last minute name so remember you can book any one of our excellent Termoli hotels up until midnight and stay the same night.